CLOCKWISE FROM TOP: Greenheck GB fan with VariGreen Drive, Model EQB-18, Model SP fan and a DGX make-up air model. Greenheck, a global leader in manufacturing air movement, conditioning and control equipment, has boosted its range of energy-efficient fans with the introduction of new products in its mixed flow inline and energy control lines. The US-based company has expanded its range of Vari-Green energy control products with the launch of the Vari-Green Drive (Model VGD-100), a factory-mounted and wired variable speed control for three-phase motors up to 10 hp. Internally mounted within the fan housing, the Vari-Green Drive virtually eliminates voltage spikes that can contribute to motor performance issues and motor failure, he points out. The preprogrammed drive uses R3 filtering technology to significantly reduce electrical harmonics back into the building. No field installation or start-up is required, saving contractors time. The Vari-Green Drive optimises energy savings and the efficiency of ventilation systems in a variety of applications. Turning to the new additions to its mixed flow inline fans, Greenheck says it has added five new sizes to its Model EQB line, which is designed to provide higher efficiency and lower sound levels. Now available in 11 sizes, nine through 33, Model EQB offers a performance range up to 26,000 cfm and static pressure up to 3 inch wg (water gauge). All Model EQB sizes are licensed to bear the AMCA (Air Movement and Control Association) seal for sound and air performance. “Model EQB’s unique octagonal housing is manufactured of formed galvanised steel panels coupled with a heavy-gauge steel drive frame that provides exceptional strength and durability,” says the spokesman. An aluminium mixed flow wheel ensures maximum efficiency and low sound levels. Standard universal mounting supports, field-rotatable housing, and removable duct collars allow for easy installation. Model EQB is recommended for indoor, commercial clean air applications where quiet, economical operation is desired. Typical installations include office buildings, educational facilities, libraries, hospitals, concert halls and parking garages. Among other innovations, Greenheck now offers a new direct drive plenum supply fan for make-up air. Its make-up air models DGX and MSX can now be configured with a direct drive, backward-curved plenum supply fan. Both models offer an operating range capable of 800 to 25,000 cfm and external static pressure up to 4 inch wg. The DGX-P and MSX-P offer additional design solutions when an application requires higher external static pressures caused by extensive ductwork or higher efficiency filtration. The factory-mounted VFD provides an inherent soft-start for the supply fan, while the absence of belts and sheaves also reduces maintenance and simplifies air balancing in the field, says the spokesman. Available cooling options include split direct expansion, chilled water and evaporative cooling. The new backward-curved plenum supply fan can lead to lower motor horsepower and energy usage when compared to other fan options, he points out. Meanwhile, Greenheck points out that its Model SP ceiling exhaust fans now exceed Energy Star 4.0 requirements, providing increased airflow with decreased power consumption and sound. 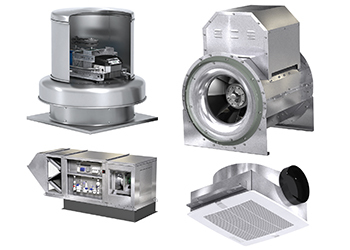 Compact in size, Model SP ceiling exhaust fans are designed for the lowest possible sound levels and offer a wide range of performance making them suitable for multi-family housing, hotels, hospitals, schools, storage rooms, and bathroom ventilation applications. “All SP fan models are licensed to bear the AMCA seal for sound and air performance and are Underwriters Laboratories (UL)/cUL Listed. Products that earn Energy Star prevent greenhouse gas emissions by meeting strict energy efficiency guidelines set by the US Environmental Protection Agency and the US Department of Energy,” says the spokesman.